As part of the nominee announcement event, Aussiecon 4’s Hugo Award Administrator, Vincent Docherty, presented some slides with voting data. The following two are quite interesting. 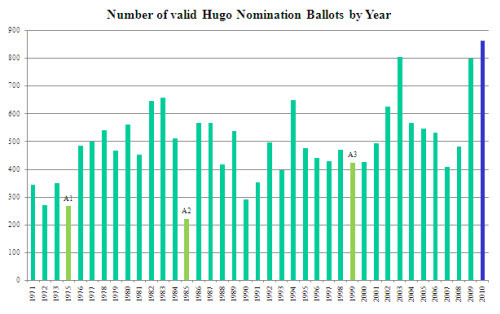 This chart shows the number of nominating ballots received in recent years. Aussiecon 4 has done very well to set a new record for participation and significantly exceeding the performance of previous Australian Worldcons (marked A1 – A3). This chart shows where voters came from, sorted by postal address. As usual, the majority of voters came from the US (there are a lot of science fiction fans in America). Canada and Australia / New Zealand also produced significant numbers. 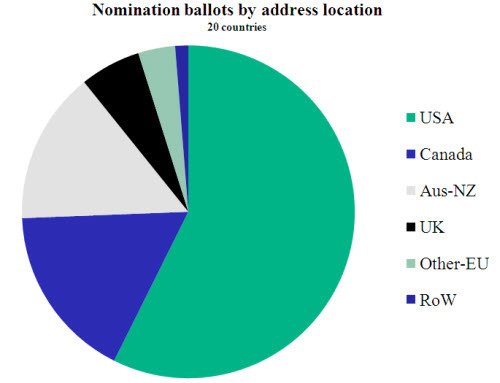 In all ballots were received from fans in twenty different countries. Those of you wanting detailed data on the nominating ballots, including the lists of runners up, will have to wait. These numbers are never revealed until after the winners have been announced at Worldcon.